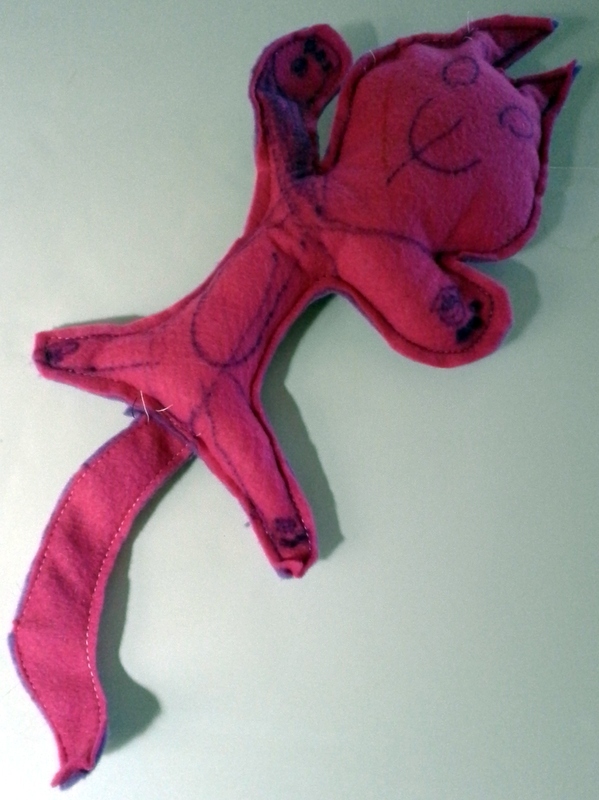 Yesterday my granddaughter wanted to make a cat doll out of felt. She drew one and I sewed it up on my old Singer. It is the first time she had seen me sew on a machine, and kept exclaiming, "You're doing a GREAT job, Grandma!" She is sure easy to please. The self-designed poncho has hit a snag: seed stitch and stockinette stitch have different row gauges. I was hoping to join the center panel (seed stitch) with the side panels (a wide rib in stockinette) using i-cord. Since I slipped the first stitch of each row on both pieces, I knit a row of i-cord with stitches picked up from the edges of each piece, then knit a row of i-cord without picking up stitches from the edges. If I want to ease the two pieces together, I will have to skip more stitches on the stockinette side, which I'm not sure I want to do. However, if I abandon the wide rib, I also abandon the pinstriping I was planning for the purl columns. This problem is a good lesson in how one design decision can affect subsequent design decisions. It is also a good reason for taking a self-designed project one step at a time. Ideally, I should have made some kind of mini-poncho with swatches, to see if my ideas would work. At least I checked after knitting the first side panel instead of forging ahead and knitting all four, and THEN discovering they would not play well with the center ones. In fact, I should knit that mini-poncho NOW, before I make any decisions about the current state of affairs. At least my transportable project is going well. The Jollyville colorway has narrower stripes than the other xmas colorways I've worked with, which adds to the fun. I *finally* finished the Easy as Pie blanket. This project has been so close to being done for so long that I almost lost hope - each of the final bits took *forever*. It seemed once the circles were squared, things should wrap up (heh) fairly quickly, but first. The squares had to be attached into rows, the rows attached into a blanket, the blanket edged, the edging bound off, and *then* the ends wove in. Fortunately, I had taken care of the ends for the squared circles quite a while ago, or the blanket might still be languishing on the coffee table. This blanket is for my granddaughter, and while finishing it, I decided no more blankets for her until she leaves for college. Once I laid it out to block, though, I'm thinking this one is big enough to go to college, assuming it lasts that long. More info may be found at my Ravelry page.